Life Book has been going since 2012….that’s how great it is! You can find out more about what the amazing Life Book 2019 has in store for you here. Make sure you sign up for the Alerts! The FREE Life Book Creativity and Wellbeing Summit is on right now (October 1-15), make sure you have registered for the Summit here. To celebrate this amazing course I’m also going to give one of you a FREE SPOT IN LIFE BOOK 2019! 2. Leave a comment below letting me know why you would love to be a part of Lifebook! I will announce the winner on October 15th. If I could learn just a little bit of what you share on FB I would be superhappy! I participated in last years Lifebook and I’ve enjoyed it so much. I’ve learned so many new ways to work and use my supplies. I appreciate all the artists who teach their talents on this format. Such inspiration to others who are willing to learn. Thanks for the chance at a spot. What a great opportunity for a year of personal growth with arty creative fun and discovery. A 2019 Arty Party! Best wishes to everyone. Hi Toni. I would love to join Life Book next year as I was unable to join in this year and I get so sad when I see Life Book mentioned all the time on my Facebook feed – I’m definitely missing out! I love the combination of creativity and wellness on Life Book, and of course, all the fantastic teachers. I would love to win a spot because i am a new artist just starting out. I would love to learn different techniques and styles to expand my knowledge and skill set. Posted on FB and shard. Would love to win a spot. Thx. Toni. You are an amazing teacher and artist. I shared on FB. Thank you for the opportunity to win. I’d love to win a spot in Lifebook 2019. I enjoy learning from such talented artists. I have really enjoyed the Summit and will be sad when it ends. I would love to be involved in Life Book 2019 to learn from all these great artists. I have loved Lifebook these past 4 years. The best thing is the variety and now there are additional wellness type things too as well as the art. I would be thrilled to win a spot. LOVE your work, Toni, and I always do your lessons in any of the classes I have taken. Thanks! What is so great about life Book is the shear variety of artists and techniques. A real opportunity to try new mediums and challenge yourself to do something you’ve never done before which really appeals to me because it means I can learn & grow. This is precisely why I would love to be able to do Life Book 2019. I have shared and commented on the Fb post. I would love to win a place in LB2019 because I have met the most amazing and inspiring people through LifeBook and Willowing. I have LOVED the interviews and activities on the Life Book Summit, and really want to do Life Book 2019. Thank you for the opportunity to win a free place in this course. Would love to be part of the Lifebook class next year. It really appeals to me as it has so much to offer. So much art variety, great teachers & ways of making regular art practice become a journey of learning & healing. Toni, how exiting you will be teaching in Lifebook next your… love your unique style. And yes, would really be happy to win a spot in this course. I would love to take part in Life Book 2019, because the summit has been so inspiring. I’ve enjoyed listening to the interviews with various artists and participating in the art activities. I think this course will enable me to grow as an artist and explore different ways of expressing myself, such as portraits which is something I really haven’t done before. I shared on face book, I get your newsletter and I love, love love lifebook. I can’t say enough good about this class. Thank you for the opportunity and for sharing your gifts with the world. So grateful for the opportunity to win a spot. Thank you so much. I have been wanting to participate in Lifebook since I found out about it a couple of years ago and just haven’t been able to make it work. I really want to commit to it this year. Art has been so therapeutic for me and to have the chance to learn from so many amazing artists is just amazing. I would love to win a spot in LifeBook 2019. I am new to mixed media and would love to learn new techniques from amazing teachers. I shared on FB and follow you. I LOVE LB and would love to win a spot for 2019, as this class started my new journey into art. It has truly changed my life and I have been a participant for 4 years. It would be great to win a spot this year. Thanks for the opportunity! My friend, Heather, has been participating in the group and added me. I’m just learning about Lifebook and it looks enlightening & fun! I love creating new pieces but more so I love to explore new techniques and mediums! Never done Lifebook before due to cost and other commitments. Now I’m retired and would love to get some sort of art routine underway. I’m thrilled with the people listed! yayyy done … I sign up! ( to your newsletter too !!!) Hugs from Italyyyy !!! oh well …. why would I subscribe to Life Book 2019? It is not easy to say it but it’s time for me to be free and to tell my truth: I was a painter, one day I began to remember what happened in my past, then I got seriously ill, sick for many years.I have been a victim for years of terrible physical and psychological violence lasted for many years. 30 years of medicines. Now I’m slowly restarting my whole life, step by step with Big Efforts every single day! I fight the PTSD(posttraumatic stress disorder) , depression and axiety, it’s hard I admit it but I want to break the fear of expressing again myself . One of my dreams has been to participate in Life Book since 2011 but all the little money has gone away in medicine and I was in a bad shape. .. Telling all this for me is Very Difficult but I want to bring out the Courage to tell my Truth, it’s hard to say … but it’s my Life, I want to Stop feeling guilty or to feel ashamed and … I want to Start all over again with a New Life and who knows, maybe one day I will be a Art teacher and help others, Smiles. So Yes I need this Opportunity! Thanks so much,. With gratitude. I love your art Toni Burt! I would LOVE a spot in Lifebook 2019! Creativity is the core of my being. I’ve been following the summit while I can, but currently aren’t able to meet the challenges with other life challenges. Wish there were more hours in a day! This is just an amazing outreach for creative people!! Thank you. I would love to win a spot on LB2019 because it’s all just so exciting. I loved your Goose Girl lesson on Ever After and your summit interview. I’m so pleased that you are part of Life Book this year. Looking forward to it! It is such an amazing program and it gives me so much joy and ton off inspiration. 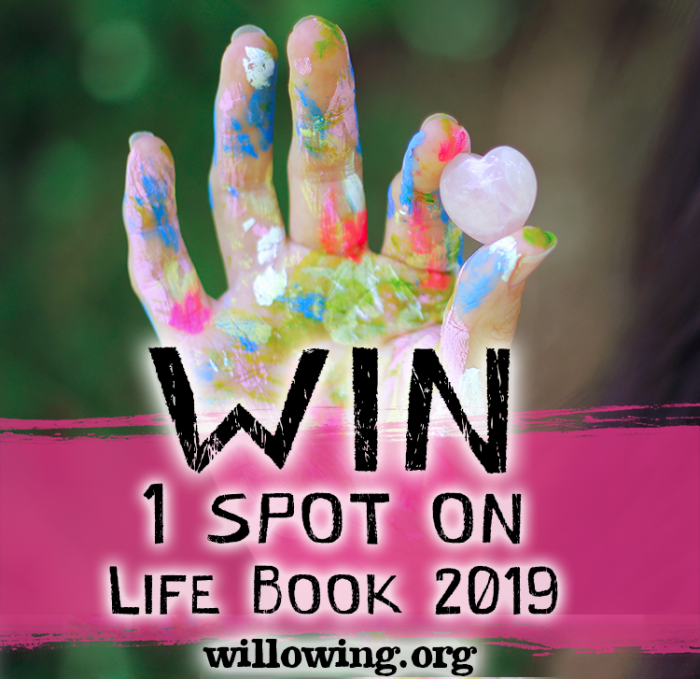 I would love love love to win a spot on Life Book 2019!! Truthfully, I have always thought LifeBook was just not for me. Every year I would just let it pass. Well that is until now. The summit has been intriguing and when I saw your interview and your art I took a double take and wondered how long I had been missing out. You are a girl after my own heart. Love your art, your herb and tincture garden and just how you view art with your left and right hands. Yes!!!! All I can say is that I am all in on LifeBook now! I would love the opportunity to take part in LifeBook 2019. It’s been so exciting doing the summit, making myself carve out time to create daily. I new to mix media. And I love the chance to learn from a great Techer’s thank you! Thank you for sharing this great art colab. I love to just art dump sorta speak. Getting swept away in tha colorful journey is a fun escape for me. I would love to experience this event. Thank you for this giveaway. Thank you so much for the chance. I love your art, was so happy to see you doing LB2019. I love learning from the different artists! Winning a spot would be so cool! I’m on a journey to accept myself as i am, to let my own self express itself (wouh, lots of “self”…). And after doing 2 two-weeks online art retreat, the lifebook will be the next step in my journey. I would love a spot for the 2019 lifebook. I have really enjoyed the summit but haven’t been able to complete everything due to time constraints, I’d love to experience lifebook at my own pace. Thank you for the chance will share post now. I would love to win a spot. Thank you Toni for this opportunity to win a free spot. The line up of teachers is amazing this year!! I have taken classes with some of the teachers but looking forward to some new teachers or new to me also !! Thank you for the great opportunity to win a place on Life Book 2019 to continue the wonderful experience I’ve had during this summit – it has been magical. I have been participating in the Life Book and Creativity Summit. All the speakers / creators for this course are amazing and the quality of free lesson content has been outstanding. I would love to be a part of this because the inspiration and motivation I get from courses like these is difficult to replicate. I would love to win this opportunity to have a year of creativity. I would love to try new things and step outside my comfort zone. I would love to win a place on Life Book 2019, to share art experiences with other like minded souls and learn from some amazingly talented artists. What more could you ask for. Toni, winning this Life Book 2019 would be such an amazing dream come true! I am your #1 fan and admire your art. Crossing my fingers and toes! I would love to win the spot because art is my life saver. I have 2 adopted special needs boys that take a lot of my time, and Art is my way to be able to give to them! Lifebook was three first online workshop that I ever took, it turned me into artist ! Lifebook looks amazing. Would love to win a place. I’ve always been worried about being able to do Lifebook… but I’m in such a rut, I think it would be good for me to get involved. Thanks for the opportunity to win… my fingers are crossed! For years I have held back on doing Lifebook just because it seemed like other things needed to take priority. After being self employed for the last 2 years, I feel like my soul and spirit need Lifebook. I need to find my joy and happy again. I need to do something that takes my mind away from work and stress and so I can get lost in fun stuff. I would love to win because I know now it’s not just about how to paint or use new tools but more about changing the way of thinking and feeling.about art journaling. I’m enjoying this Summit and the amazing instructors. The opportunity to win the spot for Life Book 2019 would be pure bliss!! I just had my 75th birthday. I am on a fixed income. I am so enjoying the summit and would love to continue on. You are all so talented and creative. Thank you so much for your generosity. I would love to win a spot in Life Book As would love to learn all the new techniques the teachers are offering. Thanks so much for the chance to win. The opportunity to learn from so many amazing ladies & be accountable for my participation in my own life growth is my drive to win a spot on Lifebook 2019. Thank you for sharing your journey. Shared on Facebook. This class looks like so much fun with much needed healing. I’d love to win a spot! Fantastic opportunity! Thanks so much. I’d love to win a spot in Life Book 2019. A great chance to learn more about myself through art and creativity. I would love to win! I’ve always wanted to pursue art, but never have. I’m new to it and need some instruction to get me started. Thanks so much for the opportunity to win! I would love to continue to learn! This event has been amazing! The summit has been an amazing experience and it’s just a taste of Lifebook!!! 😍 I would love to keep this going. I also have to say I enjoyed Toni’s activity. I loved the meeting of creativity, science, and art! 💗💗💗 Thank you. I have loved the Summit – would love a chance to continue the journey! I would love the opportunity to learn from so many wonderful artists. Lifebook would make 2019 something special. Thanks for the chance to win! I would love to be a part of Lifebook 2019 so that I can continue to explore my creative self. Shared on fb….would love to be a part of the class for all the amazing teachers who will be involved! Hi Toni, thank you for your lesson on using the non dominant hand to make art, it was so interesting. I have discovered art late in life and could do with a confidence boost. If I won a place on Lifebook 2019 it would be just wonderful. I shared & would love to win a spot- It’s time to release my artistic inner child again. The more I learn about LifeBook the more excited I am to learn from all these wonderful artists. It is a wonderful opportunity regardless if I win a spot or not. I am just incredibly grateful. I shared to my FB page and posted how much I’m loving the summit. I hope I’m a successful winner of one of the spots, but whoever wins is a lucky person. The amount of art instruction in such a positive environment is something to cherish, indeed. Thanks for the opportunity. I’ll be liking your FB page, too! Shared and would love to be a part for all the amazing teachers! I shared this on my facebook. I would like to win a free spot in this awesome class because there are so many wonderful and amazing artists / teachers (including yourself) teaching and I have so many techniques to learn from them and improve my painting !!! Thank you very much for the chance !!! I would like to win a free spot in Life Book 2019. Through this course, I’d like to explore my artistic abilities, learn new techniques, and gain inspiration from other creative individuals. Life Book is amazing and I wanna be a part of it. Thank you! I would love to try Life Book. I think it would help me learn and be more consistent in my art and perhaps it will spark a daily ritual for me of working in my journal ! Thanks fir the chance! Hi, I am new to life book and just love the summit! I hope to get a chance to continue the fantastic art and wellbeing journey in life book 2019! Shared you’re post. I’d like the opportunity to try lots of different sorts of art – which if the Summit is any indication, there will be lots of variety in Life Book 2019. Really hope to win, so I can learn more from all these fantastic artists. Really hope to win, to lezen so much more from all these fantastic artists. Loved your interview on the Summit session. It was my pleasure to share Life Book to my Facebook page. I have come through a hard 2 years of severe anxiety, deep depression and a severe sleep disorder where I only slept every 3 days over a period of about 4 months. During that time I discovered art and it honestly saved my life. I discovered Tamara Laporte through a Woman Unleashed session and was instantly smitten with her artwork, her kindness and her beautiful old soul. Being off work for 2 years I begged for birthday money, Christmas money, etc… and I recently purchased as many of her classes as possible when she had 70% off sales across her site for selected classes (OMG I was in heaven). I would be so thrilled and blessed to be able to participate in a live Life Book with the amazing 2019 line up of teachers. What an awesome opportunity. Thank you for this chance. This would be so awesome and modivating to win . I would learn so much. Thank you for allowing this chance to win. This would be an amazing opportunity if I won. I am blown away by the talented people who share their creativity in this group. Lifebook=motivation, education and fun, that is why I would like to win it! This would be my 3rd year in Life Book, so many wonderful artists lessons! I would love to win a spot, thank you for the opportunity!!!! Thank you for the opportunity to win a spot in LifeBook 2019! I would like to learn more about the connection between art and healing! Thank you for the opportunity to win a spot in LifeBook 2019! I’m a born artist, however back in 2012 years that came to a crashing halt due to a failed back surgery and subsequent chronic pain. Then, my husband fell off the roof and broke his back while I was recovering from bilateral knee surgery. I just recently realized how art really does heal; and I would love to learn more! hi, I loved your lesson of left hand on the summit! I shared on FB and would be so happy to win a free spot! Hi Toni, 2018 is my second year of Life Book and I love it. I’ve learnt so much and gained more confidence with my art. I would love to win a spot on the 2019 Lifebook, thanks for the opportunity! What a great opportunity it would be to come together with so many talented artists to share some of their wisdom. I have been in an almost standstill with creativity due to some health problems, but coming out the other side Lifebook would be a healing journey that I would love to be on. Thanks for being a part of sharing the love Toni. Would love to be able to do this course and Toni great to see you Being involved. I would love love to have a spot in Life Book 2019. What a great opportunity it would be to experience the art and knowledge of these great artists. Thank you. Life Book introduced me to mixed media art. It has been such a special experience. So excited that you will be involved in 2019. It was meant to be! I’m sitting on my bed this morning, playing with my new kitten Willow….. I have started exploring mixed media arts having always loved art and crafts. I make cards and try my hand at jewellery and crochet…. I have secondary breast cancer. It’s not curable, but I’m fighting and I’m grateful for the medication that is keeping me alive. I am not giving up! I still want to learn, to explore and enjoy art, creativity and other activities that are good for the soul….. this course would be perfect for me. A book about me, my life, my creative journey….. -here’s hoping! I have shared to my crafting page. I would love the chance for a spot on the 2019 lifebook as it would truly give me a chance to grow as an individual and as an artist. I thoroughly enjoy learning from incredible artists. Thanks for this offer. What a great giveaway!! Lifebook offers such a variety of lessons. Would love the opportunity to take it next year. I’d love to win a year of art & inspiration. Lifebook looks amazing! I’ve been there since the beginning. It’s always a well done program. Wold love to win a spot. This would help build my self confidence and also to help improve my confidence in my art work. This would be great for my self confidence and also to help improve my confidence in my art work. For the first time ever, I will have the time to take a wonderful class like this. Would love to win a spot! I would love to win a spot in Life Book 2019. For the first time, I will have the time to participate in the activities and would really like to try the different formats. They will really all be new to me, as I have wanted to try mixed media for a long time, so even the main methods will be fresh and different for me! Hi and thank you for this opportunity to win a space. I’d love to participate to keep my motivation up and running and also to learn and try and experiment 😁 Thank you!! I have enjoyed painting this year and realized that ut helps me with my stress. Life book offers so many life leassons too. I have been thinking about doing a life book. This time and season in my life are very dear and special to me. Dear Toni, I just lost my only daughter this week after a valiant fight with breast cancer. She was my biggest art supporter, my true muse. I need to heal and know this course could help me create, stand tall and see the light. I have shared on my FB! I have never done LB but heard so much good about it. Am really curious! I know there are a LOT of amazing artists in it, so I already know you will learn a LOT! So I would LOVE to win a spot! I’m new to LB this year and loving it. Can’t believe how much I have learned so far! Would love a chance to win LB 2019, thank you! Good luck to everybody! I would love to be in this class. Would love to win life Book class! Thanks for the chance! I would love to win a free spot! It would give me more money for supplies and to buy a spot for my daughter too. Thanks for the chance! Just love Lifebook 2018 and can’t wait for 2019 and especially love Toni’s art. Thanks so much for this amazing opportunity! LB is so amazing, I just love learning from so many different artists! I would love to be a part of this! I’m adoring the Summit, and am so grateful that there are other artistic souls out there that get so much from these wonderful productions! Thanks for the opportunity. I love to learn so that’s why I would love to win a spot. So many awesome artist in one class. Shared to my facebook page. This year was my first year of life book I love it! I love how it incorporates art and self care There was an amazing variety of lessons and teachers!!!! I am having such fun!!! What a great opportunity to win LB 2019! Good Luck everyone! I’m retired now, and following my dream! I would so love to win a spot in Life Book 2019! I shared in Facebook = ) I would love to win a spot. I did Lifebook 2017 and I am doing 2018. I have learned so much. Thanks for a chance ! Lifebook is amazing! What an amazing class and lineup! This yeat I did lifebook and I love it. Next yeat I don’t have the financial posebility to join, so the only option is to win a spot. Thank you for giving the chance to win. I think this is one of the best courses available! I would love to be part of it! Thanks for the opportunity! Lifebook is part of my life since 2012. Thank you for this fantastic opportunity to have a chance to win a spot. OMG! I would love to be a part of the journey!!! Thank you for the opportunity! Life book would be very cool to attend. I have shared too. Thank you for the opportunity! Life book would be very cool to attend. Soooooo generous of you to offer yet another free place in a class. Haven’t done Life Book before, so thanks for the opportunity! This would be amazing to win!! I have learned so much from you and other artists, but I know I have so much more to learn!! Thank you for this chance! I would love to win a spot in Life Book and expand my horizons when it comes to art and perspective . Always looking to learn more! Hi Toni! I am thrilled that you’re going to be teaching through Life Book 2019! I’m a huge fan of your work. I would LOVE to win a spot in this inspiring course as it would encourage and inspire me to spend more time creating. Life gets busy and creating often gets pushed to the back. I did Lifebook quite a few years ago and would love the chance to win a spot. Enjoying the summit as we speak thus would love to join the full Life Book 2019 course! Of course I love your work and classes and looking forward to learn more from you. Thank you Toni for the chances to win a spot! My reason is that there are so many amazing teachers i could never afford all the different classes and this is the perfect way of getting around to all those classes invthe most frugal way. One reason among many why I love Lifebook is because I et to meet so many wonderful teachers! I have signed up for a few of LB and absolutely love it. So many amazing artists sharing their time and art with you to inspire and motivate your creativity, even if you think your not creative this I’d guaranteed to work! So exciting to have this chance to win. I would like some me time and I think the life book would help me with inspiration and help me to follow a creative path. I would like this place as I run a art and craft social enterprise and I believe by undertaking this I will have a greater understanding on how to support my customers in their own development and growth. Hi Toni! How exciting you’re going to be teaching through Life Book 2019!! Yay! I’ve shared on my FB page. I would LOVE to win a spot for this wonderful year -long course! I have taken this class the last 2 years and I feel like it’s really helped improve my artwork immensely! And would love to take it again! Thank you so much for the chance. Two chances to win this course. Jippie. 2018 was my first year on Lifebook and I am addicted. Defenitely will be part of this amazing course next year!! I’m working so hard on myself. Trying to find my way and it is a rollercoaster. I always loved to be creative but something is holding me back to start again most of the time. I really would love to win a spot. Cause art is a way to express myself and there is so much to learn. I want to grow as a person, but also in art. I’m new to mixed media art and would love to learn more techniques to express my creativity. From what I see your course would facilitate this in many fun ways! Thank you Toni, for a chance to win. Love LB and love your art style! Was just last night watching your latest lesson. I have enjoyed and learned so much from everyone in LB! Thanks for the opportunity to win a spot…. I have taken Life Book for about 4 years now and would love to win! Thanks again… and I shared and commented on your Facebook post! I think about signing up every year… But I am afraid I wouldn’t have time to do the lessons. Maybe this is the year to make time for me. It would be such fun to do the course and at the same time a great learning experience. Shared. 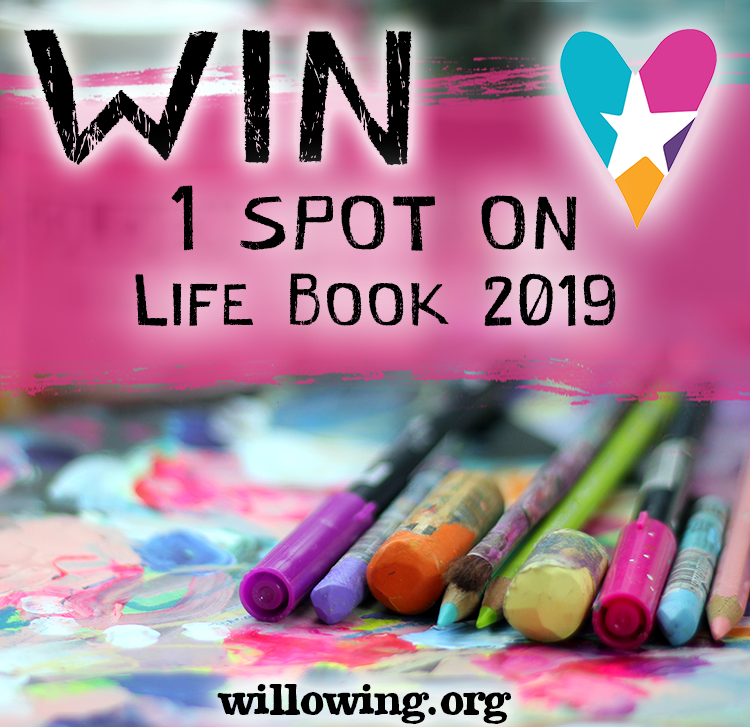 I’d love to win a spot for Lifebook 2019! thank you for the chance. I’ve done two years of lifebook already so it would be amazing to win another year. I’m excited to see you will be teaching on lifebook this year Toni – I loved your lesson on Art is Magic this year. I love everything that the Life Book entails. The course really helped me in 2017. I have a new look on life and am back doing some art each week. I have got the motivation to loose weight and I am feeling in control. It is good to wake up every day feeling positive. Would love to have another chance at this course and learn from all the fantastic creative teachers. I love the idea of blending creativity, self-development and healing into one course. We can all use that in our life. Colour and positivity in our art. I also love to watch and make “Toni Burt inspired faces”. They are so much fun! Lifebook equals growth! I love it. Thank you for this amazing opportunity. Shared and wrote on your page as well. LB is one of my favorite courses for the past few years. Such variety and talent! Thanks for opportunity. Would love a chance to learn. I’ve never done Lifebook, I would love the opportunity to do so. I would love to spend a year learning from all these great artists. Plus it keeps me learning and practicing all year long. Yeah!! Thanks for the opportunity. Wow being a part of this great course is always something to look forward to!!! Every season I wish I could sign up, but I can never justify it and working full time. Well I’m retired now and just poor. lol So………….hope to get in. Thank you! Such a great line up of artists. Every year I want to do this but it never seems to work out. This is my chance. The opportunity to learn from different Artists that I wouldn’t consider would be the main reason. Would love to continue to further my artistic journey with more new techniques! Thank you for the chance. Toni every time I draw something it always ends up being a face. I love all types of faces. Its really bizarre and I don’t know why. I love the mixed media because it provides a way to make my drawings a little bit more interesting. I adore Lifebook and the amazing gathering of teachers and students. So many wonderful and new ideas each year. Thank you Toni for the chance to win a place in LB 2019. An opportunity to expand and feed ones desire for art and knowledge. Yes please. I would love to win a spot in the Life Book 2019 course to further develop my skills and have the opportunity to learn some more skills from Toni Burt as I resonate with her style of art very much. Two things I love is being able to create with fellow artist and self discovery in the process. Love your work. Love lifebook so far. Started today. Did several warmups. Thankyou for a chance at your giveaway. I would love to win a spot in next years lifebook. There’s so many techniques I wAnt to learn to do! I will share on Facebook. I would love to win this. Last year was the first LB I wasn’t able to do, but I am SO ready for it to begin again! I have a desire to join and learn from all the fabulous teachers. I’ve never heard of life book til now. I want in 🙂 thank you for the chance! I have done Lifebook since it stated. But this year due to many expenses, I’m not sure I can afford to buy a spot. I love learning from the many teachers and love crafting. Thanks so much for a chance to win a spot. I absolutely love Lifebook. All the artists offer such amazing techniques and viewpoints. I’d love the opportunity to win a spot! I shared to my Facebook page!